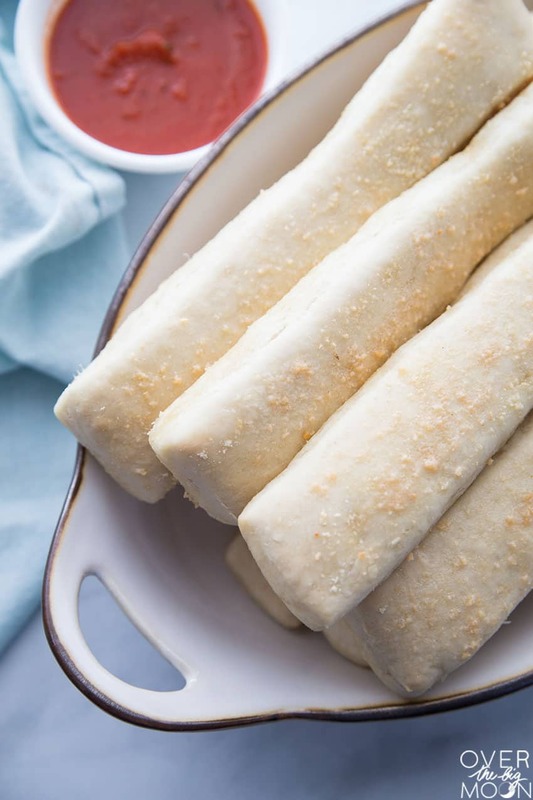 These Easy Homemade Breadsticks can be made from start to finish in about an hour! They are perfect to serve with any meal that needs a bread – specifically Italian dinners, pizza and soups! One of my favorite things to compliment my meals are these Homemade Breadsticks! I fell in love with this recipe, not only because they recipe is SO easy, but also because of the flavor! There’s a TINY hint of sweetness! Confession! I’ve been making this recipe for about 12 years now, but it was the FIRST recipe I ever made that used yeast! 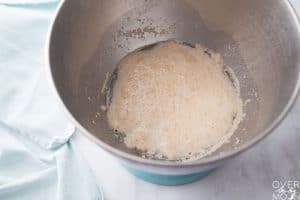 Yeast was SO scary to me before using it. So, if you’re new to baking with yeast, PLEASE don’t run away! TRY THIS RECIPE! It’s almost impossible to mess up! I ALWAYS get complimented when I make these and take them somewhere. They are especially a hit in the during the Fall months, when I make them with soups! I also love to serve them with Italian Meals or when I make Homemade Pizza! I really hope you love this recipe as much as my family and friends do! I’m confident you will! 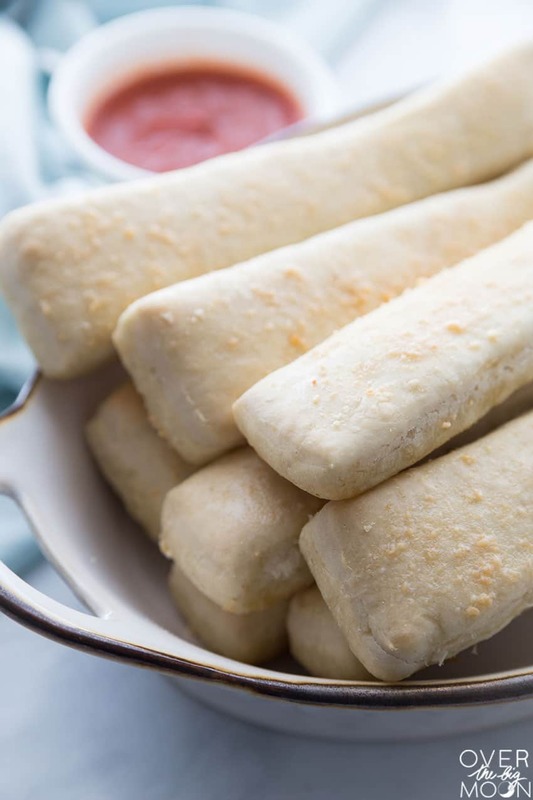 These Easy Homemade Breadsticks can be made from start to finish in about an hour! They are perfect to serve with any meal that needs a bread - specifically Italian dinners, pizza and soups! Mix together the 1 1/2 c warm water, 1 tbsp yeast and 2 tbsp sugar in your Kitchen Aid or Bosch bowl. Let sit for about 5 minutes (or until it becomes frothy). Add 1 tsp salt and 4 cups flour to your mixer bowl. I like to add the first 2 cups of flour and then slowly add the additional tow cups. If needed add a little over. 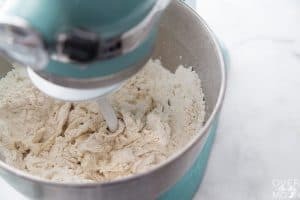 You want the dough to pull away from the sides of the mixture and not be super sticky. Let the dough rise for 15-20 minutes. Take 8 tablespoons of butter and disburse it around a 12x17 Jelly Roll pan and place in the oven for a few minutes to melt the butter the oven. 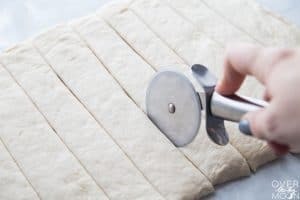 After the dough has risen for 15-20 minutes, place it onto a floured countertop and roll it out with a rolling pin a little bit smaller then your jelly roll pan. Use a pizza cutter, to then cut the dough into breadsticks. I like mine about 1.5" wide approx. Place the breadsticks one at a time onto the buttered jelly roll pan. I like to leave a little room between mine, so the butter fills the area around each breadstick. 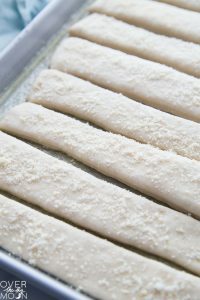 If you like, dip your basting brush in the butter and then brush the tops of your breadsticks with butter as well! Sprinkle with Parmesan cheese and a little Garlic Powder. Let rise for about 20 minutes. Bake at 375 for 15-18 minutes, or until golden brown on top and edges. I’d love to hear what you thought! RATE and COMMENT below! Perfect recipe! can’t wait to try this. Warm toasty breadsticks are the best!!! Perfect side dish for pasta!! 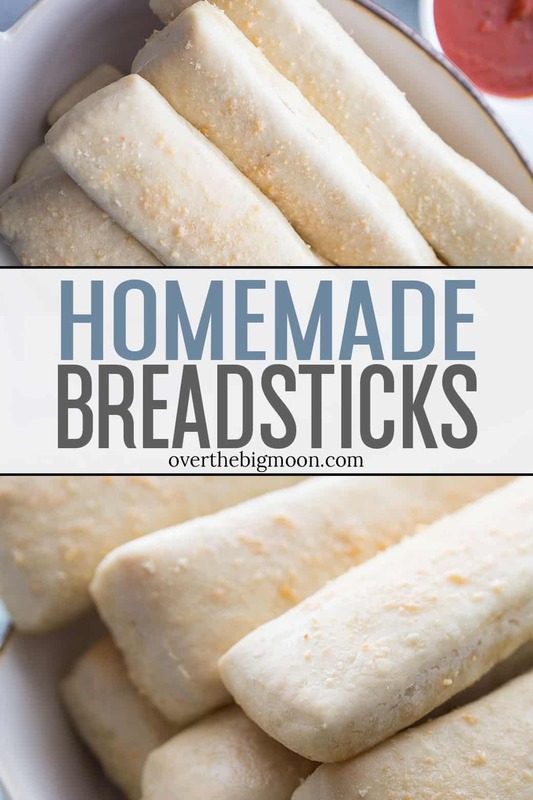 Homemade breadsticks are the absolute BEST! They smell and taste amazing! I make these every time we have spaghetti for dinner! These are the best! So light and fluffy! 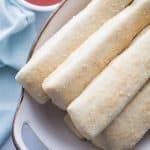 These are my favorite breadsticks ever!! YUM! I need to start mixing things up from my standard rolls for a side. I’m gonna make these next time instead. OH MY LOVELY. This looks easy and SO amazing! I’ve always been scared of bread….I think it’s the yeast. Love you girl! Such a great recipe to have kids help with! They look delicious! This is way better than rolling them individually! When you say you cut up and melt one “cube” of butter in your sheet pan, do you mean a whole stick or a couple of tablespoons? It’s really your preference – I usually do a whole cube, because then I like to spread excess butter onto the top of the breadstick dough, prior to cooking them! I just made these again tonight!!! I love how easy they are and my husband loves them. I swear I can’t make a bad batch if I tried. 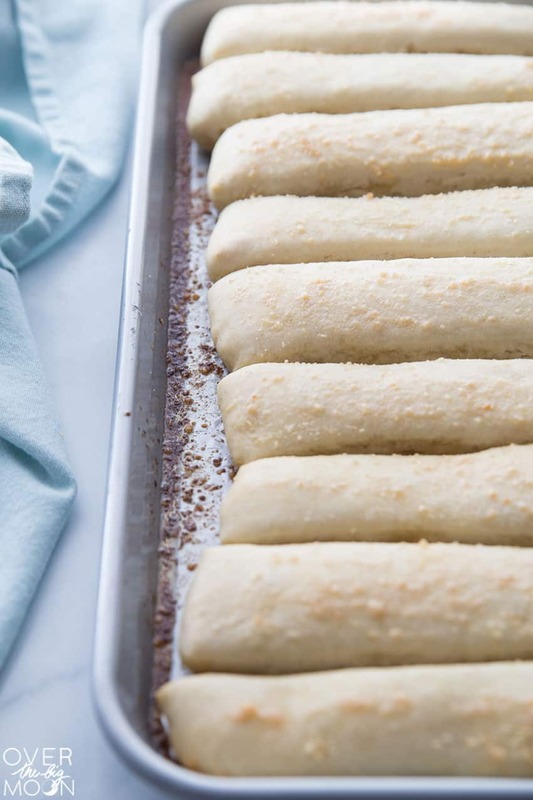 Could you maybe top them with cinnamon and sugar for a dessert type breadstick? Yummy! Making these tomorrow night! Mmmm these breadsticks look so good!!!! Is there anything better than fresh, warm breadsticks?!!!! I’ve never made them at home but will have to try sometime!! !